These's still time to book a short break or holiday for 2016 in one of our amazing Mazda Bongos. A campervan hire from GoBongo is the perfect way to explore the beauty of Wales, England and Scotland. From award winning beaches in Pembrokeshire and the Gower, to stunning mountain scenery of the Brecon Beacons and Snowdonia National Parks, you will have total freedom to explore. Our vans come equipped with everything you need for a relaxing holiday or short break. For the 2016 season our new "Gower" van has been carefully converted using all our experience, and will give a superb Bongo experience. Or you can try our amazing "Brecon" van with the ever popular side conversion. Take a look at our hire rates and then send us your dates and choice of campervan on our how to book page for a no obligation quote, and you too will soon be Going Bongo! Campervan hire with GoBongo is all about the great outdoors, and from our base near Cardiff you will quickly reach some of the best beaches, mountains and tourist attractions in Wales and Southwest England. 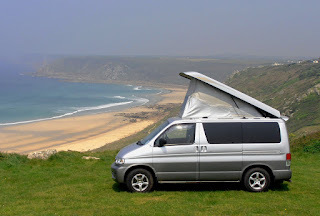 A Mazda Bongo combines all the fun and freedom of a small campervan, together with the comfort and luxury features you would only expect in much larger motorhomes. We offer a choice of campervans which can carry from 4 to 7 passengers by day, and sleep upto 4 by night, ( with additional berths available in the optional drive-away awning if required). 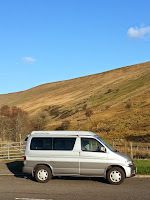 Unlike larger motorhomes, you can explore small country lanes with ease, and you will find a Mazda Bongo as simple to park and drive as a large family car. With a high up driving position and all round picture windows, there is no better way to see the breathtaking scenery in the region. At GoBongo you always deal directly with the owners of the business, and we will do everything possible to make your vacation as fun and easy as possible. You can leave a car on our premises while you are away, or ask for advice on transfers from main line train and coach stations in Newport, South Wales. With driveaway awnings, luggage box or trailer, bike racks, or roof bars for surf boards all available as optional extras, your campervan hire from GoBongo will include everything you need for a holiday to remember. Our Bongo vans are always maintained to the highest standards. Modern Mazda engineering ensures a beautiful drive and exceptional reliability, but both vans also come with full RAC breakdown cover included for extra peace of mind. Our campervans are thoroughly cleaned inside and out before every hire, and our strict "no pet" policy ensures that even those with allergies can hire from us with confidence. "Thanks again for a lovely time in your campervan. 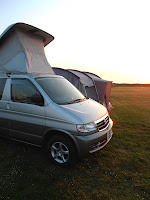 We absolutely loved the Mazda Bongo and the freedom it gave us. We had no experience of campervanning previously and were a little apprehensive about feeling cold and cramped and falling out with each other! In fact it was quite the opposite- we were warm and snug and the freedom to follow the good weather and our moods was amazing. It is a very different experience to camping in one place for a week. The bed width in the Brecon van wasn't a problem for us and it was so easy to pull out the bed at night. The Bongo was very well kitted out and all we needed was ourselves, our clothes and some bedding. We will definitely be recommending you to our friends." Jenna and Nick Burne from Gloucestershire. "Just a quick note to thank you for a great week's camper hire. We were impressed by the quality of the camper van - we saw many other Bongo campervans on our travels but none as smart as ours. It also drove very well - obviously well looked after - and got into spaces that larger motorhomes simply wouldn't have - particularly useful on narrow Welsh lanes ! Though a small camper it proved perfectly big enough for the four of us, and with the awning up the living space is vast. Your particular conversion is well thought out - the removable kitchen and full width bed in the van are both cunning ideas. All the kit we could have needed was thoughtfully supplied, and the van was well presented and provided with a comprehensive handover and plenty of instructions. We'll be sure to recommend you to anyone else looking to hire a camper, and we would also happily hire from you again." Joe Wolverson from Cheshire. "We had a lovely holiday. The service you provided was professional, thorough and friendly. Our Bongo was spotless and had everything that could possibly be required - right down to details such as washing-up liquid. The van was smooth and very easy to drive, I loved the automatic transmission which certainly helped, and also surprisingly easy to park. I have no hesitation in recommending you to other holiday makers!" Tessa Finch from Camarthenshire. "I can wholeheartedly recommend this firm. The van was exactly as described on the website, and I got clear instructions when I took it over. This was my first campervan experience and it was a great one. The van was immaculate and well-equipped. Many thanks for helping me have a lovely holiday." Anthea Gupta from NSW, Australia. Contact us with your preferred dates for a no obligation quote. You will be amazed by the quality and features of our fully equipped Mazda Bongo Campervans, and with prices starting from as little as £200 for a low season short break, you too will soon be Going Bongo! GoBongo for Campervan hire in Wales~Motorhome hire in Wales~Festival Campervan hire~Camper van hire Wales~Campervan rent Wales. Cool Camping Holidays~Rental Campervan~Campervan hire in mainland UK: Campervan hire Cardiff~Campervan hire Bristol~Campervan hire North Wales~Campervan hire Swansea~Campervans hire UK~Mazda Bongo Experts for Bongo hire in Wales~Mazda Bongo campers~Bongo campervan Wales~Mazda Bongo campervan~Hire Mazda Bongo campervan Conversions~Mazda Bongos UK - in our opinion the Bongo gives a better overall experience than a retro VW campervan.